It does happen. The three songs I’ve chosen as my top favourites of 2000 all feature clean singing. I’m not particularly biased towards either dark or clean vocals, although most of the metal I listen to these days does have plenty of growling. Dark Metal Cat has a growling purr and a clean sandbox. Today’s selection is doomy and black. That’s the sort of music that soothes me and makes Dark Metal Cat happy enough to stop ripping the furniture apart. I would clip his claws if I had tungsten clippers. He goes through about four sets of strings per gig. I’m celebrating the last year of the 20th century by choosing 15 songs, not the usual ten, for 2000. That was the year I turned 50. It feels like 14 years ago. 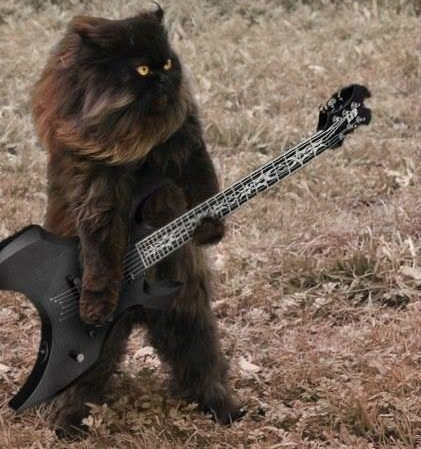 Dark Metal Cat hadn’t been born yet. He maintains he has always existed, if not physically, then in the deepest recess of inaccessible places. He sounds like Electric Wizard.